Buy works – Podlyakskiy Yuriy Stanislavovich | (1923, Khabarovsk – 1987, Leningrad). 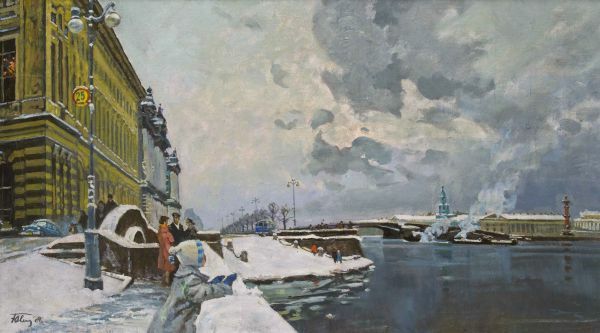 Podlyakskiy Yuriy Stanislavovich (1923, Khabarovsk – 1987, Leningrad). People’s artist of the RSFSR (1983). In 1949 entered Institute of Art, Sculpture and Architecture named after I.E. Repin, studied in B.V. Johansson’s shop. Participated in all-Soviet, all-Russia, regional and international exhibitions. His one-man shows took place in 1960, 1973. The artist’s works are represented in the State Tretyakov Gallery and many regional museums, as well as in private collections of Russia and abroad. December in Khosta. The sea. Technique: Canvas on card board, oil.